Home > Cars > Supra > New Toyota GR Supra: the legend returns! 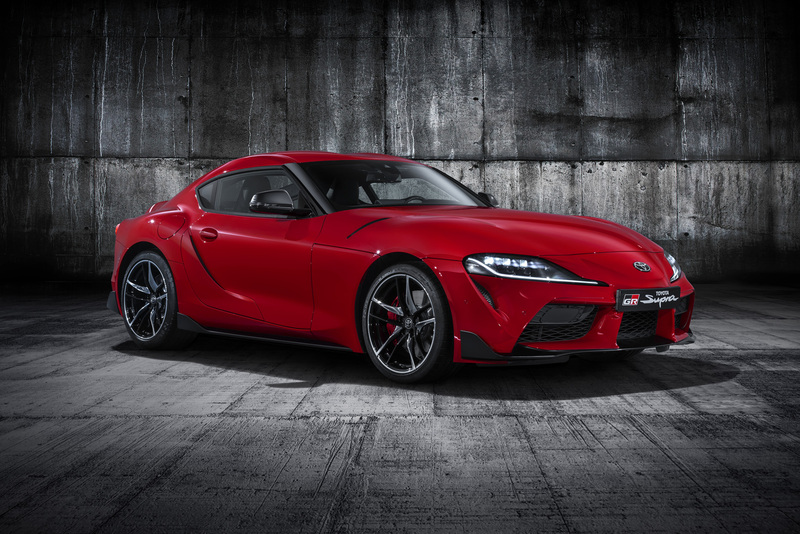 Meet the all-new Toyota GR Supra, the fifth-generation of Toyota’s legendary sports car and the first global GR model to be produced by Toyota Gazoo Racing (TGR). Driving enthusiasts can look forward to an exhilarating blend of power, agility and precision handling. These traits are achieved through the combination of a short wheelbase and wide track, light weight, low centre of gravity and highly rigid body. The 3.0-litre engine benefits from a twin-scroll turbocharger and produces 335bhp and 500Nm torque. Coupled to an eight-speed automatic transmission, it is characterised by smooth and powerful acceleration, with prodigious torque available across the full spectrum of engine speeds. TGR was instrumental in honing the new sportscar’s performance, working extensively on the famous Nürburgring Nordschleife and surrounding roads in Germany in order to achieve the most agile, stable and rewarding handling. Further extensive testing took place on roads around the world. To be certain the car delivered on its promise, Toyota president Akio Toyoda put it to the test at the Nürburgring in his role as a Master Driver before giving it his final approval. The UK line-up is introduced with two high-performance grades: Supra 3.0L and Supra 3.0L Pro. These are priced at £52,695 and £54,000 respectively. Toyota GR Supra 3.0L: The entry point to the new model range will benefit from an all-inclusive specification that extends to high-performance features and systems to help the driver enjoy the car’s full dynamic potential. These include an active differential, Adaptive Variable Suspension, and 19-inch forged alloy wheels with a high-performance brake package. Other Supra 3.0L grade features include dual-zone automatic air conditioning, Adaptive Cruise Control with stop and go, smart entry and push-button start, steering wheel with leather trim and auxiliary switches and a digital combimeter in the driver’s instrument display. LED technology is used for the adaptive headlights, rear lights and daytime running lights, while the door mirrors and rear-view mirror are all auto-dimming. Further convenience is provided by rain-sensing wipers and a rear-view camera. The sports seats are upholstered in black Alcantara and are power-adjustable (including lumbar support), with integrated heating and memory functions. The infotainment specifications feature a ten-speaker audio system with 8.8-inch display, navigation system with Supra Connect (in applicable markets), Bluetooth and USB port. Toyota GR Supra 3.0L Pro: This grade is expected to account for most of the model sales in the UK. It builds on the standard specification with black leather upholstery, 12-speaker JBL premium sound system, head-up display, wireless mobile phone charger and storage and lighting packs. To celebrate Supra heritage and the introduction of the fifth-generation (A90) chassis code, an exclusive Toyota GR Supra A90 Edition model will be built at launch, with production strictly limited to just 24 examples for UK customers. It is priced at £56,945 on-the-road. The A90 Edition will be finished in a dramatic new Storm Grey matt paint finish, equipped with matt black alloy wheels and a driver’s cockpit upholstered in red leather. In other aspects, its equipment specification will match the Supra 3.0L Pro model. The Toyota GR Supra A90 Edition will be offered to all UK customers who have placed a pre-sales reservation. The first to convert their reservation into a vehicle order will have the option to specify a Supra A90 Edition as their model choice. Detailed specifications and prices will be announced on the dedicated Toyota GR Supra websites across Europe. Customer deliveries will start from late summer 2019. All vehicles will be manufactured in Graz, Austria.